Discussion in 'Online Games - News and Reviews' started by Marina, Feb 26, 2014. Golden Cobras™ Deluxe from Novomatic at StarGames will have you venturing to a far away land. Journey on into the opulence of India and be mesmerized with seductive sounds and graphics with this stunning Novomatic video slot. you riches as it dances to the sounds of the Pungi and the Guru can multiply your winnings to great riches. bet per spin will vary dependent on your bet size and number of lines played. appear, it will trigger the free spin feature. The Wild symbol is the Guru and substitutes for all symbols except the Snake Basket Scatter. on the reels. One basket will turn into a flute playing snake charmer as the Cobra comes out of the basket to reveal your number of free spins. the winning combination. 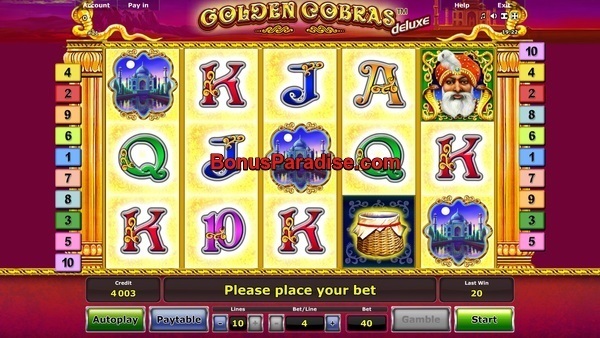 Watch the top of your screen as the Golden Cobra drops a multiplier. Hope for the 25x the winning payline and your winnings could be astronomical. 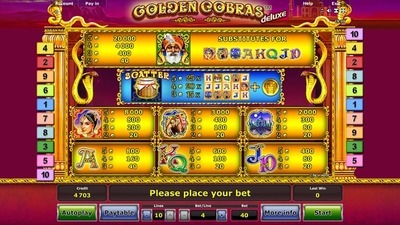 The Novomatic Slot Golden Cobras™ Deluxe is now live at Stargames !